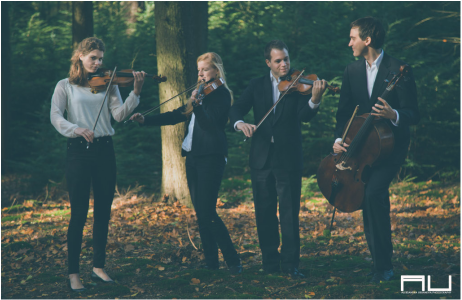 String quartet Ravivo offers live music for a variety of functions in The Netherlands and Belgium. String quartet Ravivo can provide the personal touch for your wedding, or elegant background music during a reception or dinner party - everything is possible with the diverse repertoire that includes classical music, pop songs and world music. "You played very beautiful, with high quality and a sense of the style and the rhythm of the ceremony"
"We appreciated their fantastic interpretation of the piece of music special composed at our request"
Do you have plans for a wedding, reception, dinner, special function, theatre or film production in the Netherlands or Belgium? You can contact String quartet Ravivo directly, and let us know what String quartet Ravivo can do for you! Just fill in your contact details in the form below, or e-mail us at ravivokwartet(at)gmail(dot)com, and we will get back to you ASAP.